UNITED NATIONS—Autumn brings falling temperatures, chill winds, and mournful memories which swirl like fallen leaves on the historical landscape. Darting shadows hide in the golden sunlight to reappear as the specter of the past in the late afternoons. History needs retelling as the calendar tells us it is late October. The cavernous UN General Assembly hall which once echoed with poignant pleas to help the embattled Hungarians sixty years ago, today became the setting for a spectacular Hungarian musical concert, Freedom First, in which the orchestra of the Hungarian State Opera and soprano Andrea Rost commemorated and honored the spirit of the 1956 Revolution against the Soviets. UN Secretary General Ban Ki-Moon recalled that, as a twelve year old in his native South Korea, he and his classmates had heard that “Hungary was under the boots of communist oppression” and had appealed to the former Secretary General Dag Hammarskjold for help. Ban confided that when he became Secretary General, he hoped he would never receive such letters from besieged places, but he has from throughout this troubled world. Autumn 1956 was an anxious period in America with a presidential election between Dwight Eisenhower and Adlai Stevenson and the Word Series showdown between the Brooklyn Dodgers and the New York Yankees. Yet in far off Hungary the glowing embers of resentment against communist rule exploded into a full scale armed revolt against the Soviet rulers and their local comrades, the first and last such sustained uprising in the former East Bloc. The Soviets were stunned and fought to a standstill in Budapest. Crowds of pro-democracy demonstrators ripped down communist symbols and gleefully smashed Stalin’s massive statue, and tore the socialist symbol from the center of the Hungarian flag. A new reformist Prime Minister, Imre Nagy, became the symbol of a free Hungary. Hungary had crossed the Rubicon to political freedom; there was no going back. Yet, Imre Nagy’s government appeared, through an extraordinary turn of fate, to have beaten the Soviets. Late October’s euphoria was short lived. In early November the Soviets counterattacked with massive and brutal force. Budapest became a battleground as Soviet tanks and artillery pounded the city. The free Hungarian government made a desperate plea to the world and the United Nations for help. That same fateful weekend in the Middle East, the Suez Crisis was at its height with British/French forces trying to secure the strategic Suez Canal in Egypt. The UN Security Council was in overdrive with back to back meetings on both Hungary and Suez. To further complicate the situation these momentous events were just days before the U.S. Presidential election which would see Dwight Eisenhower returned to the White House. James Mitchner’s book the “Bridge at Andau” masterfully chronicled these epoch times. 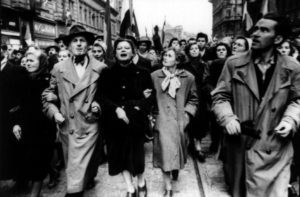 The Hungarian Freedom Fighters, even in defeat, emerged as a political pole star for a generation of Americans and Europeans. Even today, walking around Budapest, one sees bullet holes from the revolution. Over 200,000 Hungarians fled their homeland in those anxious days into Austria and then onwards to the USA, Canada and elsewhere. Despite enforced exile, their education and perseverance saw that they would prosper. Sixty years later Hungary recalls these fateful times.